Chaya Rappoport, a 17-year-old, Swiss-born blogger, writer and cook carries an appreciation for the culture and traditions of her family's heritage while using her varied upbringing to formulate a unique palette of her own that is both reminiscent of her childhood in Zurich as well as her life in New York. It was from her Swiss grandmother, who she calls "Bubby" (yiddish for grandmother), that she learned the art of fine cuisine while the American flavor of her cooking came from the introduction of "pumpkin pie, burgers and New York pizza" following a move to Brooklyn where her mom had roots. Rappoport now lives with her family in beautiful Rockland County of upstate New York, an area rife with Revolution history and bountiful in natural beauty, from the Ramapo Mountains down to the fertile valley along the Hudson River where she and her mother enjoy cooking with seasonal produce from local farmers. While she admits her cooking is heavily influenced by her formative years in Switzerland, she also embraces traditional Jewish food and says she enjoys "adding new twists to old recipes." Chaya's skills in the kitchen reflect the beauty she seeks in daily life. From Swiss heirloom recipes of chocolate mousse and plum tarts, to Jewish babka and challlah and American pie, she embraces the art of home cooked food with a rare dedication for someone her age. Her food shows up at social events, parties with girlfriends, festivities in her local Jewish community and on the table at home. This summer, she took her love of pie baking to a new level by taking orders from local customers, turning out delicious lattice-topped creations of blueberry, blackberry, plum and peach. She says, "If I could bake pie all day, I'd be a happy girl." Currently a senior in high school, Chaya plans to live abroad for a year after graduation and then hopes to attend culinary school. And after that, she says, "I'd love to have a bakery specializing in pie and bread - that's definitely a dream of mine!" 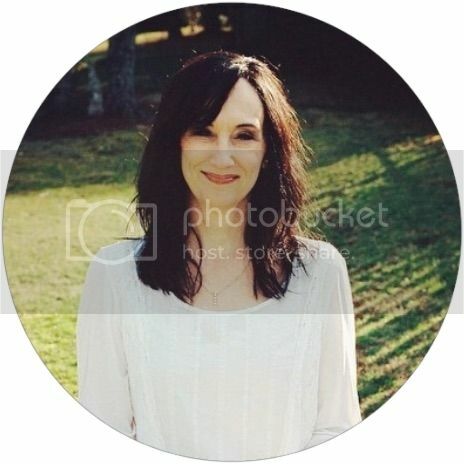 For now, she enjoys her life as the blogger of Retrolillies where her skills as a writer, cook and photographer can shine. While she misses her grandmother's influence and their life in Switzerland, she is thankful Bubby is only a phone call away and she can regularly call her for advice. "I love baking pie so much that I decided to sell some this summer." Put us on your customer list, Chaya. warm honeycomb and golden berries. A clean-out-the-fridge galette packed with figs, apricots, blueberries, strawberries, peaches and plums. Blackberry rye scones made with buttermilk. Umm, yes. Triple-layer chocolate cake with chocolate butter/whipped cream, garnished with ganache and sugared strawberries. What birthday girl wouldn't be ecstatic with this dream come true? Salted peanut butter cups are perfect to eat alone or to sprinkle over ice cream. 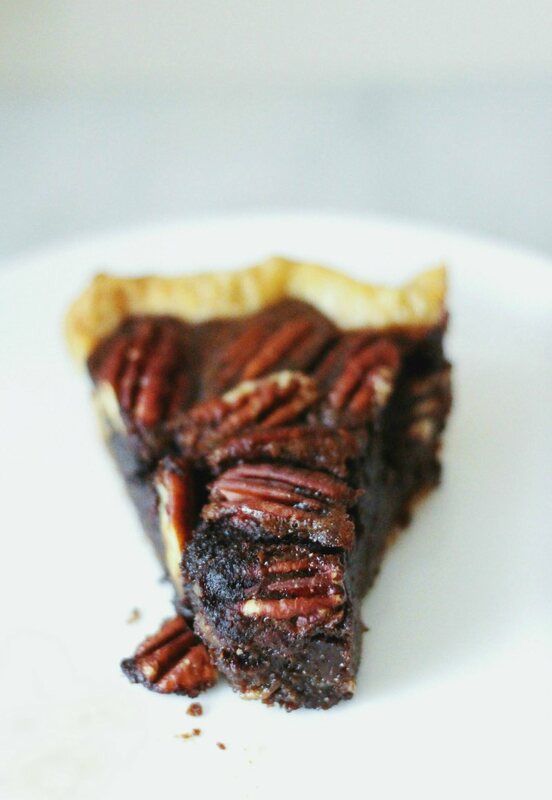 Chocolate Bourbon Pecan Pie. Enough said. "My favorite things to bake are made by hand: sourdough bread (I've kept a starter for almost a year now), pie dough, brioche, etc. For me, there is nothing like kneading a mass of dough and watching it turn into bread, or cutting butter into flour and watching flaky pie dough expand in the oven." A beautiful still life of figs. Those gorgeous figs went into this this galette with pears and frangipane. and make an ethereal chocolate mousse from four ingredients." "In Switzerland, there is a very big emphasis on beauty, art and cleanliness. People spend time in nature - going hiking and taking day trips to the Alps - and there's less excess, but everything is done well and with attention to detail." and the real, earthy side of everyday life requires a different approach." The Hudson River Valley produces an abundance of fresh fruit and vegetables. 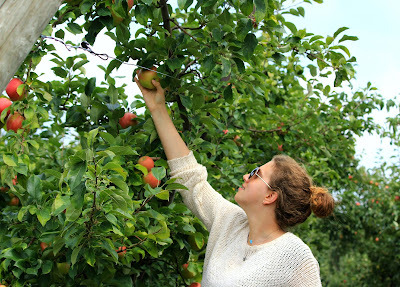 Here, it's apple picking time at an orchard. 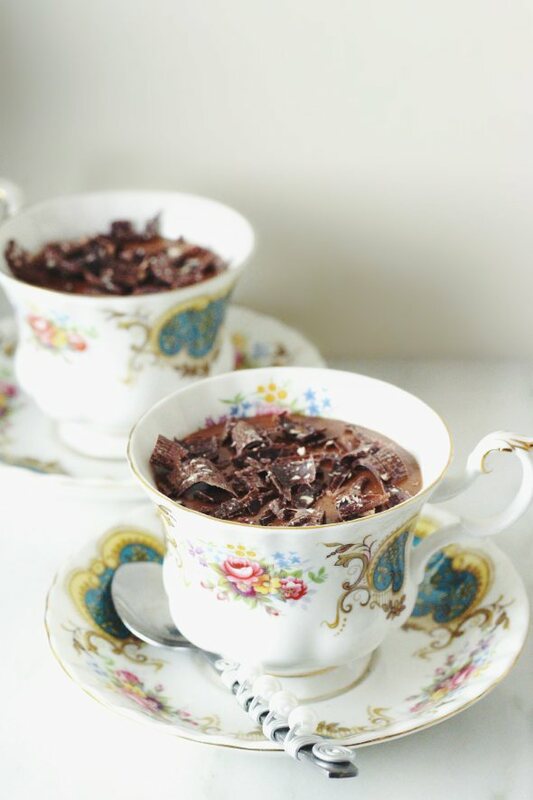 Why I love this recipe: this is one of those recipes that uses a few, simple ingredients to create something really delicious; in this case, a rich, decadent chocolate mousse. Heavy cream and dark chocolate make this velvety and smooth, whipped egg whites add the classic, airy texture, and the vanilla bean adds an extra dimension of flavor. Chop the chocolate into small uniform pieces, then melt the chocolate over a double boiler. While the chocolate is melting, slice the vanilla bean lengthwise and scrape the seeds. Add the seeds into heavy cream. Once the chocolate is melted, add heavy cream into chocolate and whisk continuously until shiny and smooth. Remove from a double boiler and let cool. Separate the whites and yolks. Beat the yolks and sugar and fold into the chocolate mixture, making sure that the chocolate is sufficiently cooled so that the yolks don’t scramble. In a separate, clean and dry bowl whip the egg whites with a pinch of salt until soft peaks form. Gently fold into the chocolate, taking care not to viciously deflate the mixture. Divide between four teacups and refrigerate for at least 4 hours. Serve cold with grated chocolate over the top. 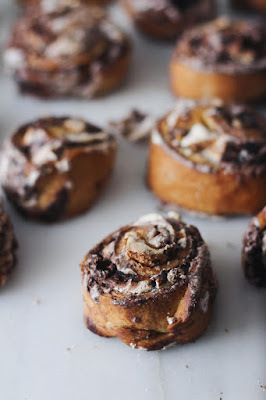 Why I love this recipe: made with a yeasted dough, these hybrid bun/cookie swirls are crunchy, filled with soft meringue, and spread with a heady mixture of cocoa and cinnamon. Walnuts give these cookies irresistible texture- don’t leave them out- and add a faintly nutty flavor to the mix. Best of all, the recipe makes a large batch, which is perfect for Chanukah parties this time of year. 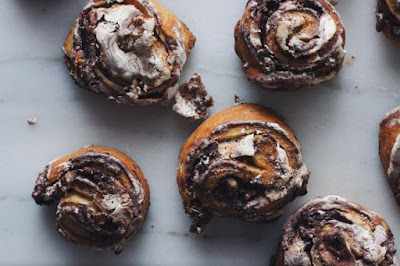 Notes: the dough is only minimally sweet, and since the cocoa and cinnamon mixture is kept unsweetened, it’s important that you use all the meringue, which is what gives these cookies their wonderful sweetness and soft, almost marshmallow-y inner texture. Be sure to divide the meringue evenly so that there is enough for each piece of dough. I often double this recipe as t he cookies freeze well, when tightly wrapped, for a month. Combine the water, yeast, and one tablespoon sugar in the bowl of a stand mixer. Let sit, covered, until the yeast is proofed and bubbly, ten minutes. Add the rest of the sugar, salt and the egg yolks to the bowl. Mix well to combine. Add the butter and flour to the bowl and again, mix well to combine. Refrigerate the dough overnight. The next day, let the dough come to room temperature. Meanwhile, whip the reserved egg whites and the cup of sugar together until stiff, marshmallow-y peaks form. Spread each rectangle thickly with meringue, leaving a 1″ border around the sides. Mix the cocoa and cinnamon to combine and divide the mixture into four, sprinkling it onto each rectangle, on top of the meringue. Top each portion of dough with 1/4 cup of chopped walnuts. Then, roll the dough up, starting with the side nearest you, to the side across from you. You will now have four long, thin logs. Slice each log into 1/2″ sections. Place the cookies on parchment paper lined baking sheets. Bake each sheet for approximately 25 minutes, or until the cookies are browned. Let cool and enjoy! All photos by Chaya Rappoport and used with permission.